Looking for inexpensive stocks to ride an aging demographic trend? These five Big Pharma stocks are trading at steep discounts. This has been a roller-coaster year for pharmaceutical stocks. The iShares U.S. Pharmaceuticals index, which follows the performance of the largest U.S.-listed companies in the industry, is still 17% lower than where it stood 12 months ago. That's well above low points seen earlier this year, but there are still some bargains out there. Research and acquisition-happy AbbVie (NYSE:ABBV), Allergan (NYSE:AGN), and Pfizer (NYSE:PFE) are poised to grow faster than their prices imply. Generic giants Mylan (NASDAQ:MYL) and Teva Pharmaceutical Industries (NYSE:TEVA) have also been left behind. Let's walk through some figures together to see why shares these five Big Pharmas are so inexpensive. Inbound competition for AbbVie's Humira has been hanging over this stock like a dark cloud since it spun off from Abbott in 2013. Those clouds started crackling with lightning earlier this month, when an FDA independent advisory panel voted 26-to-0 in favor of licensing Amgen's ABP 501 as a biosimilar to Humira. The extremely popular anti-inflammatory still makes up about 60% of AbbVie's total sales, but AbbVie has been making strides to diversify its revenue stream with some bold purchases. The $21 billion acquisition of blood cancer drug Imbruvica has a chance of contributing estimated annual revenue of $7 billion following an FDA approval in March that made it the first chemotherapy-free option for untreated patients with the most common form of leukemia. Further out, its recently approved blood cancer pill, Venclexta, and late-stage hopefuls could offset losses to Humira competition in the years ahead. If successful, investors will look back at its current price of about 13 times this year's earnings estimates as incredibly cheap. However, if biosimilar competition for Humira stifles growth, the dividend could keep you from sitting on losses. At recent prices, the stock offers a juicy 3.6% yield, which AbbVie could raise significantly. Adding to your top line by acquiring companies and their products is relatively easy, but in the drugmaking business, getting those acquisitions to work for shareholders is often elusive. This is what makes Allergan so compelling. Although its share count ballooned 211% over the past five years, free cash flow per share is 184% higher than it was at the beginning of the period. The deepest concern at present is Allergan's frightening balance sheet, which finished March with $38.55 billion in long-term debt and just $2.26 billion in cash and equivalents. The long-delayed $40 billion sale of its generics business to Teva should go a long way toward shoring up its finances and should allow it to purchase more winners such as Botox. While its cosmetic use garners derision from the public, Botox has earned approval for eight therapeutic indications that have kept the franchise on pace to reach $2.55 billion in sales this year, after 27 years on pharmacy shelves. That nose for value is why billionaire activist investor Carl Icahn has taken a "large" position in Allergan while praising its star CEO, Brent Saunders, recently. At about 5.4 times trailing sales, and 17 times this year's earnings expectations, Allergan is the most expensive Big Pharma stock on this list. If Saunders can make lightning strike again, however, its recent price is incredibly low. 3. 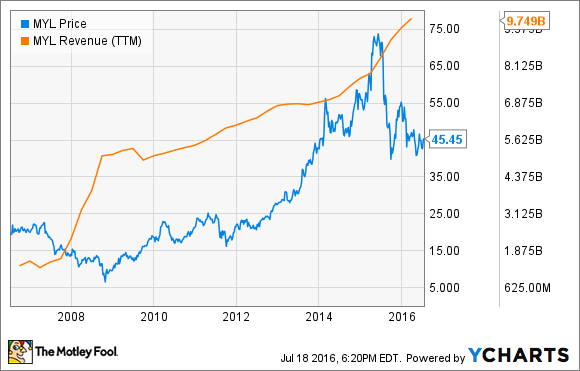 Pfizer: What patent cliff? Pfizer has struggled to grow since losing exclusivity for Lipitor and other key drugs, but strong uptake of breast cancer capsule Ibrance, pneumococcal vaccine Prevnar 13, and rheumatoid arthritis pill Xeljanz has the Big Pharma on track to finally pass its years-old high-water mark. First-quarter sales of Prevnar 13 rose 15.5% over Q1 2015, putting the drug on pace to pass $6 billion in sales this year. A recent label expansion to U.S. adults age 18 through 49 should help. Xeljanz is finally gaining traction, with first-quarter sales more than doubling over Q1 2015 to $195 million, but the biggest success story is Ibrance. Following accelerated FDA approval last February, it's rocketed up to a run rate of $1.7 billion based on first-quarter sales and is on its way to reach peak annual sales estimates of $5 billion. Pfizer's trading at about 15 times this year's earnings estimates, which seems awfully low for a company that posted first-quarter revenue growth of 20% (about 9% if you don't include $1.2 billion from the Hospira operations it acquired last September) over the same period last year. With a nice dividend offering a yield of 3.3%, this Big Pharma stock is wonderfully inexpensive. About nine years ago, Mylan was a much smaller U.S.-centered company when it bought the generic-drug operations of Germany's Merck KGaA for about $6.7 billion. When the company reported first-quarter sales, North American generic-drug sales comprised just 42% of the company's total revenue. Earlier this year, Mylan stock received a pounding when the company announced its intentions to acquire Sweden's Meda, another global generic-drug maker, for about $7.2 billion in cash and stock. The premium is steep, but Meda's operations would allow Mylan to expand into territories it doesn't have a presence in yet, including China. We'll have to see how the deal shakes out, but I'm inclined to believe it will help the company's top line continue its climb. At recent prices, this Big Pharma stock is trading at about 9 times this year's earnings estimates. For a company that has already proved it can make large acquisitions into new territories work, that's unbelievably cheap. In the first quarter, sales of its blockbuster multiple sclerosis therapy, Copaxone, led Teva's specialty-medicines segment 10% higher than Q1 2015 to $2.15 billion. The company's other half of operations, generic-drug sales, put up almost the same amount, with $2.17 billion. Much more of the specialty-drug segment's sales filter to the bottom line, which makes this company heavily reliant on a handful of drugs at present. Teva is about make some big changes. Its $40 billion purchase of Actavis Generics from Allergan has been drawn out longer than expected, but it should complete soon. While other companies are complaining about generic-drug price erosion, Teva maintains its bullish stance on the industry. According to Teva's global generics CEO, Sigurdur Olafsson, other companies are having trouble because they lack new product launches. Teva launched around 450 new drugs last year, and assuming the deal with Allergan completes, it will launch 1,000 new products this year and 1,500 next year. If the Actavis deal goes through as expected, management is predicting that adjusted earnings will climb from $5.42 per share last year, to between $6.90 and $7.40 in 2019, but at recent prices Teva stock is trading at just 10.6 times this year's earnings estimates. With a dividend offering a 3% yield, this might the cheapest Big Pharma stock of all.